Catania, aci-castello: Buy in Sicily - Real Estate offers an exclusive sale of an elegant villa in Mediterranean style, with swimming pool, located on the hill of Aci Castello, with spectacular sea view. 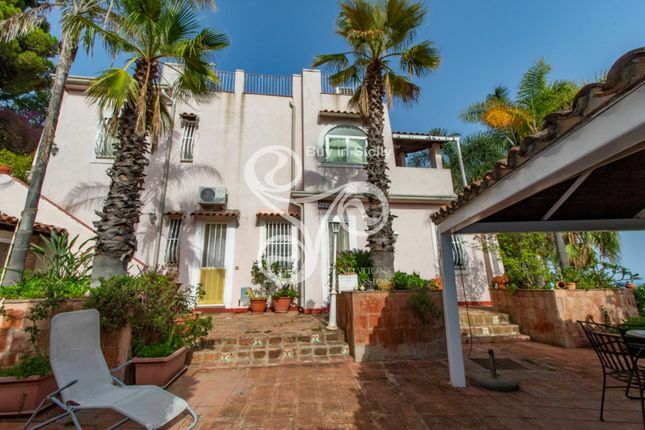 The property extends over a plot of land of about 1600 square meters of which 400 square meters dedicated to the villa on two levels and 1200 square meters for the garden. From the main door there is a large entrance with a large granite staircase that acts as a hallway between the two levels. The ground floor consists of a large living room that overlooks the villa, an ample bedroom, a comfortable kitchen, a bathroom and a Studio which has direct access to the terrace level. On the second floor we find the master bedroom with study and attached bathroom with access to a second level terrace with sea view. In addition, there is a second apartment totally independent and recently renovated, consisting of kitchen, a bedroom with walk-in closet, a bathroom and a terrace overlooking the sea. The garden is distributed on 2 terraces and cultivated with the classic Mediterranean plants, contains a wonderful swimming pool where you can spend pleasant summer afternoons enjoying a breathtaking view of the Gulf of Catania. Also in the garden was built a masonry target that looks at the Hill. The villa located in a dominant position on the hill area of Aci Castello contains the essence of our land, the scent of the sea and orange blossom. Property descriptions and related information displayed on this page, with the exclusion of Running Costs data, are marketing materials provided by Buy in Sicily Real Estate, and do not constitute property particulars. Please contact Buy in Sicily Real Estate for full details and further information. The Running Costs data displayed on this page are provided by PrimeLocation to give an indication of potential running costs based on various data sources. PrimeLocation does not warrant or accept any responsibility for the accuracy or completeness of the property descriptions, related information or Running Costs data provided here.